Ever since a team of Navy SEALs busted into terrorist mastermind Osama bin Laden’s secret Pakistan compound and put a bullet through his eye, a debate has raged: Was it disrespectful to use “Geronimo” as a code name in the operation? This blog post was not authored to take an issue on the brouhaha one way or the other. It is noteworthy, however, to point out all the other places Native American culture have been used in military naming conventions. From the Apache helicopter to the Tomahawk missile, a variety of gear, vehicles and weapons have been assigned Native American names — including the Marine battalion in one of the most dangerous places in Afghanistan right now. First Battalion, 5th Marines, out of Camp Pendleton, Calif., uses “Geronimo” as its call sign. The unit is currently patrolling Sangin district, where its sister battalion, 3rd Battalion, 5th Marines, engaged late last year in some of the heaviest fighting of the Afghan war. The logo for 1/5 also includes a small likeness of a Native American. A Marine source with the battalion tells me that it likely dates back to the World War I, when the unit was attached to an Army brigade that had a similar logo to commemorate their victories over native tribes in the previous century. Readers, I’d be interested for your thoughts in the comments section below. Undoubtedly, the practice is offensive to some Native Americans, who bristle at the use of Native American-inspired naming conventions on just about anything, including sports teams. On the other hand, a case can be made that 1/5 and other military units like it are honoring the warrior spirit of the Apache, Blackfoot, Seminole tribes and other communities whose name has been adopted. This was a case of Political correctness gone amuck as it usually does. Grow the hell up and quit crying like babies, its getting old. Its like playing the race card, its over used and tiring. This was nothing more than an attempt by a Native American group to garner a little attention or to get some money from the federal government. The “Indian Head” the emblazons the logo of 1/5 is from the US Army’s 2nd Infantry Division patch, of which the 4th Marine Brigade, comprised of the 5th and 6th Marine Regiments along with the 6th Machine Gun Battalion, made up half of that Division in WWI. The is the same division that John A. LeJeune famously commanded during the war. 2ndID’s patch was proposed initially becasue one of the Division’s regiment’s, the 9th infantry, had gained so much fame during the Indian Wars. It was a tribute to the gallantry of their former enemy. The symbol is used on the logo of 6th Marines and 1/6, 2/6, and 3/6. The rich history that is America’s is often used in our military to keep that history alive. Naming choppers after Tribes has long been a tradition and even supported by many Native Americans. At the naming of the UH-72 Lakota helicopter Joe Red Cloud, a chief of the Oglala Sioux Tribe, part of Lakota Nation, was there to commemorate, and even “bless” the event and the name. As American Warriors we chose to embrace our rich history, not supplant it. The Geronimo name was not even used for bin Laden; the name used was Jackpot. 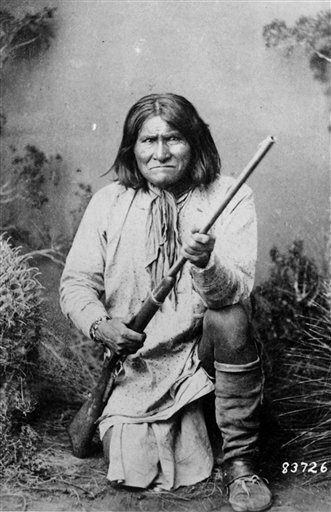 Geronimo was a codeword chosen as something unique, and certainly All-American, easily recognized that would be easy to understand over radio comms to broadcast one simple message; the SEALS killed or captured Jackpot. The use of Geronimo should be seen as a honor. It is only becasue as a society we have grown so used to weakness and sensitivity and the mere thought of a racial undertone that this is taken as offensive. My Ancestors fought in many wars for this nation, and a distant one even fought against it in the Revolution. Personally I would have been humbled had the SEALS used the codeword “Tysinger” for a kill against our greatest enemy. Ted, thanks for the perspective. I was aware of the 3/6 logo following my embed with them last spring. The details on 2nd ID and 4th Marine Brigade are appreciated. Ted, thanks for sharing that information. When all of this first went down I read an article on yahoo news “Indians say bin Laden code name another insult” One of the main people making a big deal about this was Suzan Shown Harjo, president of the Morning Star Institute, a Washington-based Native rights organization. “It is shocking, really shocking, that this happened,” said Harjo, a member of the Cheyenne & Arapaho Tribes of Oklahoma. Many were quick to jump on all of this when facts were not even straight. Below is one of the comments taken from that very article. I believe this gentleman hit the nail right on the head. “This is to all the Native American people and everyone else that is misunderstanding what happened here. The United States military is very proud of the long history of service of Native Americans and frequently uses imagery and icons from our shared past. Geronimo is a extremely commonly used term in the Army to refer to bravery and invoke unit and American pride. There are many units in the Army that have native icons and names. The newest and best helicopters all have native names to detonate bravery and power. The Kiowa Warrior, The Blackhawk, The Apache, The Chinook are all names given to our best and most powerful helicopters. As much as people want to try and divide this country and promote their dividing views, in this situation they are completely wrong. Most Americans that have family in this country for more than two generations have Native blood running in their veins from their ancestors. Although people would look at me and call me and my wife white, my fathers family was part Iroquois and my wife is part Cherokee and our families have been here for hundreds of years.. I replied to NathanG’s post and thanked him for setting this straight. I went on to share the same example on how 1/5 uses their call signs. To add to Ted’s information, the very Emblem of this Battalion (1/5) and that of the Army’s 2nd Infantry Division has a Native Americans Head as part of the overall design signifying the first and original American. Believe it or not, there is more respect out there than one might think. Semper Fi! @ steve flynn – apparently the idea of correcting past wrongs or owning up to them didn’t get to you. Your incessant whining and overall racial bigotry is the same thing we Natives have heard time and time again. You should just thank the Native, for if it were not for them you would be speaking Japanese as a primary language. Stereotypes are over. Grow up. Who are you to honor natives? This is the same honoring rationale natives get from sports teams, cartoons, Hollywood and consumer products. Who really needs to “grow up” here? A people that have learned and adapted to foreign cultures after being here for thousands of years, or a profit infested culture that changes populism at the drop of a temporary and fickled trend? If you are truly Americans, you will stick to your own American heroes like Custer, Chivington and George W Bush! You are what I call “smiling racists” because you equate dead symbolism with living beings. I served in Korea and hated the 2nd Divisions chief emblem. It makes soldiers look like comic book drawings. If the native Americans want racial segregation, stop accepting money from other races to help with your financial needs. Enough is enough of the social disgrace bulls**t. All cultures experienced “growing” pains from century to century. As an American German I would take it as an honor if the Military would use anything from my ethnic backgrounds. Isn’t that what America is based on for the respect of the diversity of our people???? “Smiling racists”?????? Sir, we respect our dead with everything from monuments,symbols,and carrying on names of our past relatives and countrymen to our “living” family members, with total RESPECT!!! Keep an open mind and don’t label others unless you support communism. All of this racist talk is nothing but a bunch of WHINING…as a natural blonde haired blue eyed woman, I personally know that men from ALL races dream to have me…they speak with forked tongues trying to act to their friends they do not, but in secret they approach me, and if I accept, they proudly display me on their arms…at Pow-wows American Indians amuse each other with talk of “taking back the land from the white man”…so BLIND as the last time I looked I saw Pacific Islanders, Orientals, Middle Easterners and the like being born here, living here and contributing to our nation…DUUUHHHH!!! I would like to add as a 3rd generation San Diegan I too am Native born and take offense at all this propaganda…Indians are NOT the only Native born people in the U.S. so quit with the labeling of yourselves in order to BE somebody…BE somebody through your works not by a label…EVERY race has been enslaved at some point in history…WOMEN have been throughout history and still are enslaved by men…the point is SHUT UP, YOU LOST because you were fighting against each other and took Tecumseh’s strategy as foolish…as a white woman I say GET DOWN to the military for honoring warriors in this manner no matter what race they are or what point in history they occupied!!! All this racist talk is about dividing our country from within…FOOLS!!! Division from within is the strategy of the enemy and the last time I looked, it ALWAYS worked!!! Again, DUUUHHHHH!!! @ TerryMussell: “You are of German heritage. You’re not German. There’s a big difference. A German would have more of a problem with what you speak of. But, since you are an American first, you find it easier to call it B.S. American Indians are just that, American Indians. They are not Americans, living vicariously through their ancestor’s Old World cultures. Their identity is their religion, their faith and their life. It’s not something they celebrate once a year to show some kind of reverence to the 1/16th of ethnicity that’s left in their blood. They live their identity everyday. Your heritage does not give you the same cross to bear”. This from a friend that posted from another site which I agree with. Most European descendants have no roots to their European culture. They are just another weed cultivated on Indigenous lands of America with no ties in belief, or lifeways of their heritage. That’s why they precariously make inclinations of “get over it” and “get a thick skin”. I’m sure if they, Americans, were in another country like Asia, Africa, or Middle East, and some Asian or Middle Easterner made bad remarks about Americans, they wouldn’t think twice about making a complaint or getting upset. I know I’ve seen Americans get all riled up about pity little things when I traveled abroad while in the military. @ CS Calkins – don’t kid yourself. Most natives only want a white woman of your description because a woman of your description is easy. That’s it. As for “proudly displaying” you, its like taking a cow to auction, you show it off till you get the highest bidder. @ Terry Mussel – I’m sure Operation Hitler wouldve been just as acceptable? Or Operation Rudolf Hoss? And for the others, I’m sure that your conscience remains clear, but I’ll be the first to laugh when in reality, you’re making minimum wage, you voted for Obama and you’re still living at home. Anyway, contiue with your racial stereotype, just proves that I’m still better than you. Aaron…You sir, are OUT OF LINE!!! How DARE you insinuate I am “easy” because I am a natural blonde/blue!! I NEVER said I went with them all, I said “IF”!!! “In secret” meant I was approached when no one was looking while I was momentarily unescorted…YOU assumed me to be “easy” as you have labeled me due to my appearance… I was merely stating a FACT…in my personal experience MOST men regardless of race want a blue eyed blonde haired woman whether they admit it to their friends or not…looking around, if this is not so, why do many women dye their hair blonde and wear blue colored contacts? You must NOT want to show off your wife, as you insinuate with your comments you are married to a dull, boring and dowdy woman, one you want to hide which is NOT flattering to her!!! She should slap you for that!!! I also NEVER stated that I dated the men who showed me off…the majority of them were my very close friends, proud to be my friend as I was proud to be their friend and accompany them as such regardless of their race…escorting me on their arm provided me their protection and honor which was a necessary comfort for me during my single days…I have been happily married to a full blooded Ute Mountain Ute for over 15 years…he STILL loves to show me off on his arm offering me protection and honor, still proud to be my husband as I am proud to be his wife, our racial differences are irrelevant to our married relationship…Your last comment to “others” reveals your true self, an arrogant narrow minded, thinks you are Bob Bitchen above others snob!!! Wow…it is too bad that some of the commentators are not there with you…doing your job! You could send them out in front of u! It is because of the work that you do that they have the freedom to shoot their mouths. Don’t let it get to you…you guys are my heroes…my favorite Marine is with you! Take good care of each other…pray for you all daily! Thank you for the post…miss him terribly, and he is in ur video. 🙂 Hurry home! You are missed and loved every minute you are away! If by “group” you mean the vast majority of Native Americans, perhaps. Love the racist insinuation that Natives are welfare cheats trying to mooch off the government, too. President Obama was quoted as saying Bin Laden was “Geronimo.” Everything else is spin concocted by apologists for the president or the military. If you can prove Obama didn’t mean what he said, go ahead and do so. Until then, you lose the argument. As a Native American and a marine, I think it’s pretty cool to see elements of my heritage (although I’m not Apache, I’m mostly Lenape and Seminole) used to confront enemies in the name of America. After all, I’m actually American, the rest of you guys are just hanging out here -just kidding. But I really think it’s absolutely appropriate to incorporate our heritage wherever we can -it is the real deal hollyfield American heritage. Everything else about America is little over 200 years old -just recent history compared to our contemporaries. I don’t mean to downplay the last 200 years, but I think they are equally OUR history, not just mine. Its YOUR culture too now if you claim to be “American.”. So why is it a big deal? Geronimo should be to the Marines as William Wallace is to the Scottish Guards. As for all you people suggesting we want white women and government money, please take yourselves to wherever Governor Perry sends Coyotes. I personally go for hispanics because… I mean seriously puerto rican and south american chicks are the hottest chicks. No one goes after white women anymore. Where did you get that noise? You must all be pretty old. And my family hasn’t seen a single dollar that didn’t come from a days work or a merit-based scholarship. I don’t know a single native American profiting from government handouts. If I were you I’d complain about all the folks profiting off of predatory payday loans. A lot of us are or were doing that. I’d also like to point out that we are not Indians, Pakistanis, or Afghanis. I mean if someone’s last name is A-ha-la-ko-chee, please use common sense. At first I WAS pretty mad when President Obama called Osama “Geronimo” But now that I read all the facts, I’m actually a little proud about it. By the way, I’m not Apache, I’m from the Rosebud Sioux Tribe. Hello there, I discovered your site by means of Google whilst searching for a related matter, your site got here up, it appears to be like great. I’ve added to my favourites|added to bookmarks. Yes I am full blooded Apache and very proud of my heritage and Nation’s reputation. I also serve as an 0351/0331 Marine Corps Infantryman. I now am a Deputy Sheriff and proudly serve my community. But the ignorance and disrespect is the only thing I really hate. Don’t insinuate that just because YOU think its ok according to your way of thinking that it’ll be ok for American Indians. I’m sure if the operation was called Martin Luther King Jr. that you would have a negative response from the African American Community. Or if everyone judged white people from the actions of the Nazis and labeled them accordingly would that be an honor? How bout trying to understand and communicate first before using a name associated with a great people and then try to say we’re honoring you….